Workplaces that will win in the future require a change in strategy today. At the core of that strategy sits a focus on strengths. CliftonStrengths solutions are essential to empowering your managers, developing your employees and improving your organization’s performance. And a winning culture is one that values strengths-based development. 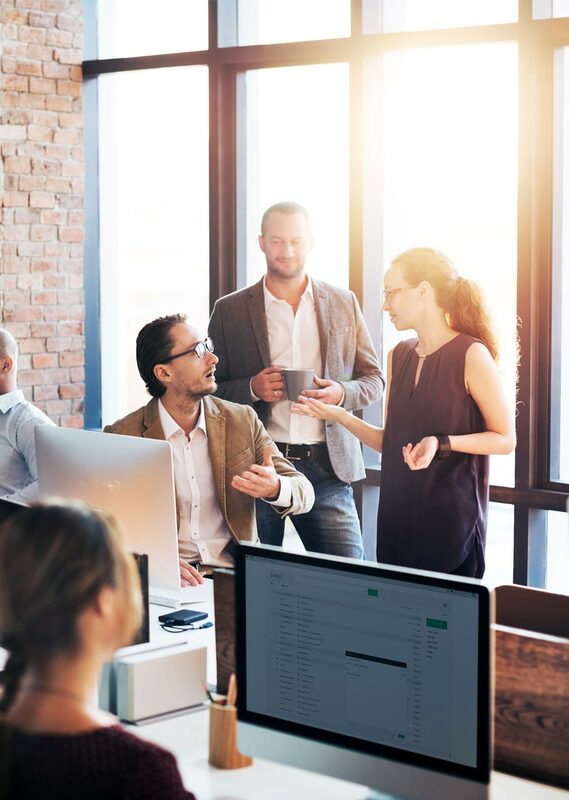 Because a strengths-based workplace is transformational; it’s a culture that focuses on continual growth and improvement among everyone in the organization. In transformational, strengths-based workplaces, culture is borne of a shift from the old ways of managing people to the right ways of developing them. People want work that’s meaningful to them. Understanding where they’re strongest allows employees to connect with their company’s purpose. People don't really care about frivolous perks at work. They want to be developed in ways that tap their natural talents so they can succeed. People want managers who can coach them to understand and apply their CliftonStrengths, and who value them as people and employees. People want ongoing feedback and genuine discussions about how they’re doing, not a one-time and one-sided meeting. People want the chance to do what they naturally do best, every day. Because weaknesses never turn into strengths, and strengths develop infinitely. People want an authentic relationship with managers that includes talk about both work and life. They want to work somewhere that values their strengths and invests in their ongoing development. Watch how organizations boost their performance on the outcomes that matter most using CliftonStrengths. Gallup research reveals that the most effective leaders are always investing in strengths. They understand that how they position, develop and empower their people makes all the difference in their workplace culture. And they experience firsthand the benefits, both measurable and immeasurable, that a strengths-based culture can bring to their business. See what successful strengths-based development looks like in action. We won't rest until every organization in the world brings the power of CliftonStrengths to their employees. Meet a few of the companies redesigning their cultures with strengths-based development at the core of their efforts. Employee turnover shrank from 42% to 1%. Engagement results skyrocketed to the top of Gallup’s database. Teams realized less conflict and a greater focus on talents to overcome obstacles. Check out these resources to better understand how you and your teams can benefit from building a strengths-based culture. Your strengths-based culture starts here. Start your journey today toward building a winning workplace using CliftonStrengths. To learn about our premium enterprise solution, contact us. Create stronger teams and a strengths-based workplace. Give every employee the opportunity to discover what they naturally do best and learn to use those talents to perform to their maximum potential. 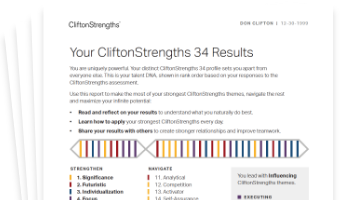 Empower team leaders to get the most out of their people’s CliftonStrengths. Have ongoing coaching conversations proven to create more engaged, higher-performing individuals and teams. Send individuals to Gallup’s Accelerated Strengths Coaching course and support their development. Watch them deliver transformational guidance and help to employees and teams, empowering them to be their best.